“Eldorado Group” LLC offers a wide range of wall and roofing sandwich panels. Sandwich panels are widely used for the construction of various buildings, including for the construction of commercial and office buildings, agricultural buildings, warehouses and industrial buildings. In addition, sandwich panels are extensively used in the reconstruction of façades and for thermal insulation of existing buildings. In the first case, the products can be used as fencing and self-supporting structures when erecting buildings and structures utilising a frame and panel method or as lining materials for the reconstruction of façades. Inside the building, they can serve as sound and thermal insulation partitions, for example in shopping malls, where it is necessary to maintain a constant temperature in some areas, or in production shops, some parts of which exhibit a high level of noise. Excellent technical characteristics led to the application of sandwich panels in many areas of the construction industry. Sandwich panels are complex structures consisting of three layers, with each layer performing a specific function. Each of these insulating materials has its advantages. Mineral wool is produced on the base of basalt fibres – it’s a natural and environmentally friendly material. Sandwich panels manufactured on its base have high performance characteristics – heat and sound insulation properties, resistance to temperature drops and fire and environmental safety. Polyurethane (PUR) and polyisocyanurate (PIR) foams are synthetic polymer insulation materials. Wall sandwich panels manufactured on their base have performance characteristics such as high heat, water and sound insulation properties, low specific weight, durability, biological stability, static and dynamic strength. Fire-retarding agents specially added to these insulation materials provide these polymers with fire safety properties. Polyisocyanurate foam is a modified polyurethane foam: its molecular chain is predominated by isocyanate group. During its polymerisation, stronger and more stable bonds form. Heat conductivity coefficient of polyisocyanurate foam is even less than that of polyurethane foam – 0.019-0.022 W/(m•K) and provides PIR sandwich panels with the insulation properties unmatched to date. The encasing of sandwich panel’s insulation material is made with shaped or flat steel sheets. The shape can be standard – trapezoid, wavy or rectangular – but we offer varying shaped sections, which combine standard and micro-section. When mounted, sandwich panels are joined with the frames using exposed or concealed mounting system. “Tongue-and-groove” type locks and labyrinth and groove connections ensure a solid surface and increase the load-bearing capacity and resistance to natural stresses. Such technical solutions significantly accelerate and facilitate mounting of structures, which is performed in strict sequence. Also, our range is suitable for the construction of freezers and refrigerators, with cold panels used as frost protection structures. Refrigerating chambers are ideal in ensuring maximum possible duration and quality of storage for perishable goods. During their construction, panels of special design are used for the refrigerating chamber. These chambers are of various sizes made with sandwich panels designed for the temperature up to -1°C (medium temperature) and up to -25°C (low temperature). Thanks to its design, this kind of building materials can withstand various temperature drops and can be used for the construction in all kind of weather conditions. Polymer coating of sandwich panels provides reliable protection of sheeted steel against harmful external effects and has a high resistance to abrasion and a resistance to acid environments and ultraviolet radiation. Sandwich panels are indispensable products in modern construction. They have a number of obvious advantages over brick, concrete and other building materials. Using sandwich panels, you can dramatically reduce the thickness of enclosures and partitions when erecting buildings, which in turn will increase the usable area of the building and reduce loads on the frames and foundations. The maximum length of one sandwich panel is limited to the capability of a rolling mill and transport and may reach up to 16 m. The width of the sandwich panel is determined by the standard width of a smooth sheet – 1.25 m – and a type of the shaped section and interlock. 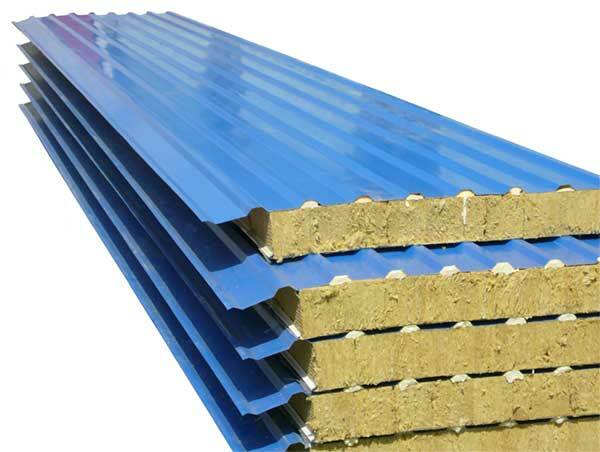 Generally, the useful width of the sandwich panel is 1 – 1.2 m.
The main difference between wall sandwich panels and roof sandwich panels is the existence of stiffening ribs in roof sandwich panels, which increase the strength of the product and provide a more reliable coupling. “The Fifth Façade” or flat roof is becoming a more and more popular solution both in the industrial and private construction. Compared to the pitched roof, its mounting requires significantly less labour and financial costs, but its operation is more convenient and safe. The outer layers of sandwich panels are made of shaped or flat steel sheets. Trapezoidal, rectangular or waved shape applied to the sheet is considered a standard, which exponentially increases the rigidity of the structure. A decorative sandwich-panel is made with steel sheets, covered with a layer of polymeric powder paint or polyvinyl chloride. The colour will be chosen in accordance with RAL international scale, offering a wide range of colours. During installation, each sandwich panel is mounted on the frame utilising exposed or concealed fastening method. “Tongue-and-groove” type locks and labyrinth and groove connections provide the mounted panels with the appearance and properties of the solid surface. The piece-by-piece installation method significantly facilitates mounting and reduces its duration. New construction systems of modern architecture are the meeting point of avant-garde technological characteristics and aesthetic values. The rainscreen systems are able to satisfy the highest demands of consumers regarding the latest trends, stylistic innovations, functionality and practicality. Thanks to the use of materials and systems ensuring both high aesthetic quality and architectural result at the same time, rainscreens represent one of the examples of technology designed to ensure high rates of sound and heat insulation. Façade systems would allow to solve a number of technological, architectural and technical tasks. Sandwich panels provide a building with a high degree of thermal and sound insulation. Their ability to “breathe” creates an optimal balance of temperature and humidity inside the room, and eventually positively affects microclimate. We offer different types of sandwich panels, depending on the application, filler type, thickness and size of the structure. At the request of the customer, the following materials can be used: – polyester coating (PE); – plastisol (PVC); – epoxy coating (EP); – polyurethane coating (PUR); – polyvinylidene difluoride (PVDF). Approximately twenty of the most popular colours of polymer coating are used in the production of sandwich panels*. However, if you are not satisfied with the standard colours, you can order any other colour offered in RAL catalogue (more than 200 colours). For more information on the offered sandwich panels and conditions and terms of their delivery, please contact the managers of Eldorado Group.